GRAND RAPIDS, Mich.—Attorneys in the case of a wrongful death lawsuit filed on behalf of the widow of Nation of Islam Student Minister Robert Dion Muhammad were back in court recently presenting additional motions in front of the judge who will ultimately decide if there is enough information to proceed to a jury trial. (See Final Call Vol. 36, No. 48). One critical decision made during the mid-September hearing by Judge J. John Rossi was the scheduling of an upcoming November court date when both sides will present their final arguments. However, Judge Rossi made it clear that he would not promise a ruling on that day. 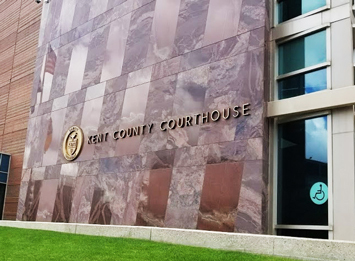 The Sept. 14 hearing was less intense compared to three weeks earlier when Judge Rossi at the Kent County Circuit Court ruled on several critical motions over an arduous and sometimes tense two-day period. “The rulings (today) kind of dealt with how we would proceed forward. The three motions that we filed, one of them was a Motion to Reconsider the Motion to Amend. That’s a very substantive motion which there will be a written order for that. Today was a procedural type day that did not require a lot of fireworks,” said Atty. Berve Power Muhammad who along with Atty. Sadiyah Evangelista Karriem represent Yreva Muhammad, wife of Robert Muhammad. The body of what would have been the 40th birthday of the husband and father of eight was pulled from Muskegon Lake in Grand Rapids on Sept. 6, 2014 after he went on an outing with co-workers. Mrs. Muhammad, her legal team as well as several members of Robert Muhammad’s family and supporters, do not think his death was an accident as authorities have claimed, but that several of his co-workers had something to do with what happened that fateful day leading to his death. There are at least six different law firms representing eight co-workers named in the lawsuit. Mrs. Muhammad’s legal team filed three motions requesting that Judge Rossi reconsider his late August rulings that went against the plaintiff on three key issues, one of which was to amend their original complaint filed because of new and critical information that could lead to clues and more information about what really happened to Robert Muhammad. The judge previously denied several plaintiff’s motions including the inclusion of testimony by an aquatics expert. The motions to reconsider provide an opportunity for the judge to review the requests again. Judge Rossi said he would make his rulings on the plaintiff’s motions known in writing and would not hear oral arguments from attorneys on either side. It is up to the judge’s discretion on when he will make a decision on the motions to reconsider, explained Atty. Power Muhammad. Kent County Courthouse in Grand Rapids. Judge Rossi also scheduled upcoming dates for the defense attorneys for parties in the lawsuit to file their summary disposition for their arguments, for Mrs. Muhammad’s attorneys to respond and for the defense to then reply to those responses. “The one thing that I am very pleased about is that we have a firm schedule for our response and we can plan in advance for the hearing on the 7th because other than having a preset schedule, it would be whenever the defense counsel would decide that they wanted to have it set for hearing and you have to conform and that’s why our Motion for 28 Days to Respond,” explained Atty. Power Muhammad. Defense attorneys have argued the lawsuit is frivolous and that the death of Robert Muhammad, who served as Study Group Coordinator for the Nation of Islam in Grand Rapids, was a tragic accident. Three additional minor motions defense attorneys were set to present on Sept. 14, were resolved with Mrs. Muhammad’s attorneys prior to the hearing. Today was just another step in the process, said Atty. Evangelista Karriem. “We believe that we will continue to be the victors in this. It’s just a process of a civil wrongful death suit,” she said.